During the summer my friends Lisa and James were going to sell off a bunch of their records at the Fort Greene flea market but got scared off because it was maybe going to rain. It didn't. I wandered around looking for them to no avail, as they had stayed home. I called Lisa and went over to her house. We caught up and I looked through the records she was going to sell. I picked out a few and she declined payment. I told her that sooner or later they would end up here. The Sterling Silver single is one of those records. I was just going to post the single and the comp song when I discovered that the CD was available from the label for $6. If you enjoy it don't hesitate to paypal them the money immediately. 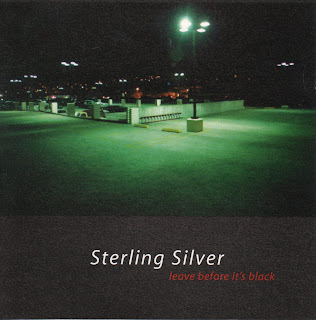 Ladies and gentlemen, for your listening pleasure, Sterling Silver. We handmade all of those silver 7"s. Good times! Cool to see these tracks posted. Thanks!